The CBR250R brings motorcyclists an innovative approach to riding, one that’s both appealing and fun. Beginners and experienced hands alike will recognize the economy and extreme versatility of this sporty little ride. Equipped with a very efficient 249cc liquid-cooled single-cylinder engine featuring a sophisticated four-valve DOHC cylinder head, counterbalancer, and PGM-FI fuel injection, plus the option of ABS and more, this dependable lightweight delivers nimble handling, a broad spread of easily accessible power, excellent fuel efficiency and low operating costs, all in one. 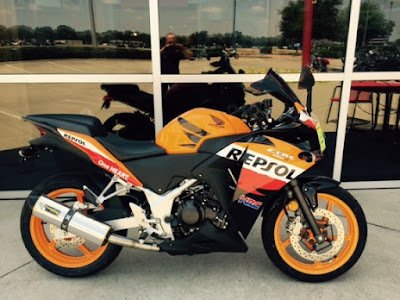 Put it to work for your daily commute, quick trips around town or weekend back-road explorations; the CBR250R does it all while delivering as much fun per mile as anything around, all at a price that just about anyone can afford. Comes with exhaust, wind screen, fender eliminator kit, and rear seat cowl. Total Sale Price is $4699.00 plus all fees, and already includes prices of accessories and labor. Miles Per Gallon - 77 MPG - Honda's fuel economy estimates are based on EPA exhaust emission measurement test procedures and are intended for comparison purposes only. Note - Specifications subject to change without notice.